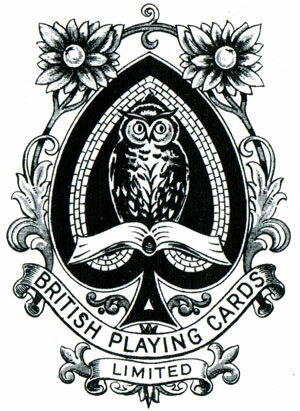 This company was the predecessor of Universal Playing Card Co. and involved Alf Cooke of Leeds and Bemrose of Birmingham, and maybe one or two other printing firms. They operated from c.1920 until 1925, when Universal P. C. Co. started. Their court cards are rather odd, as they take a few of the traditional features and disperse them in very non-traditional figures. They are similar to the courts used by Dondorf during this period. 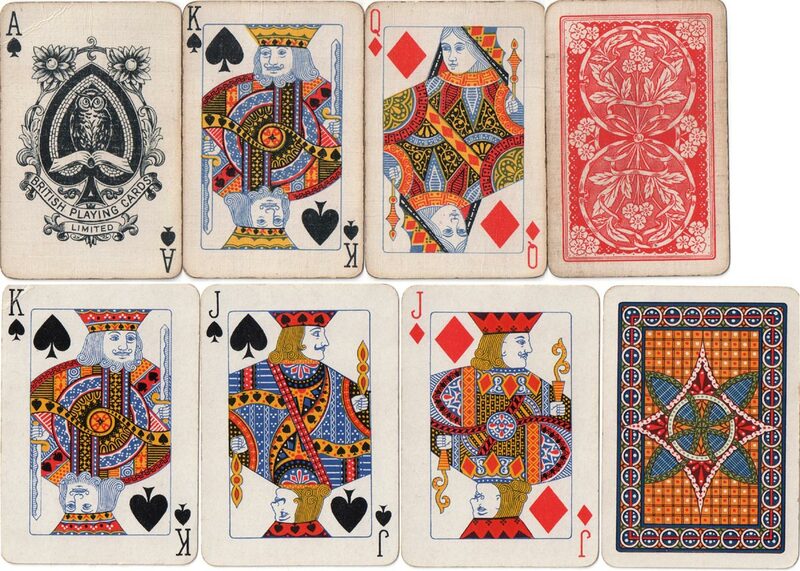 Above: court cards by B. Dondorf, c.1920s click image to see comparison. One unusual feature of the courts is that they were altered quite a lot in the short period they were used. Below is a pack of Linési wide-size cards with box and tax wrapper, stamped in red. This brand was clearly copying the brands of other makers such as Goodall’s Délési for W. H. Smith and their Linette brand. De La Rue had Flaxette and Waddington had Twillese. 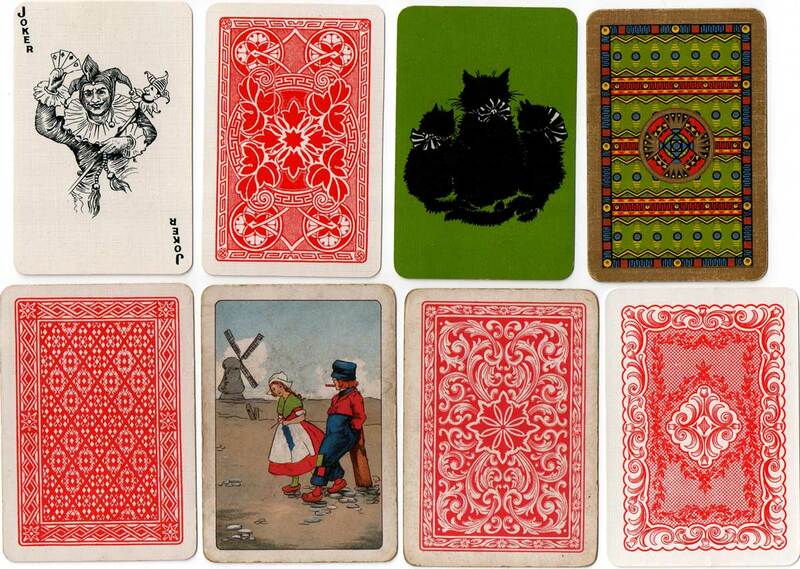 They were all originally made with a linen finish to help dealing and shuffling. The wide AS is very like the anonymous one used later by Universal and the bridge-size one is the named design. Above: pack of Linési wide-size cards with box and tax wrapper, stamped in red. 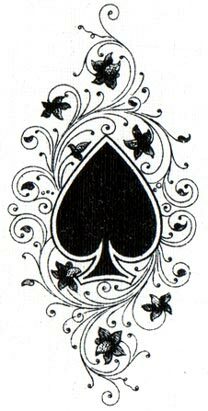 The wide AS is very like the anonymous one used later by Universal Playing Card Co. and the bridge-size one is the named design. The alterations to the designs that can be found are unusual in that most of the design is retained but the position of the heads is altered. This applies only to the kings and jacks. Also there are different sizes of hats on the jacks and variation in the colours. A few examples are given below. Compare the head position of the kings with those above. 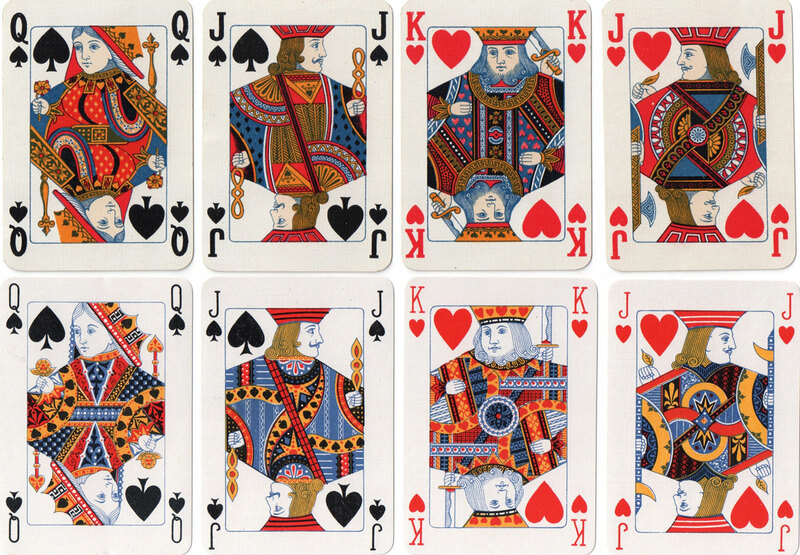 Above: the KSs above are the same, the KH’s crown has more blue on it in the top row, the jacks’ hats differ in size and the head position of the JC is different. Above: various brands. The Bijou bridge-size brand in a slide-in box with an unusual crocodile-skin-finish label on the front. The back design is quite like the one from the Luxor pack. There is a variety of back designs, both pictorial and decorative, some of which are inspired by those of other makers. The wide-size Dutch design is very like one by Goodall. There is one design of joker. 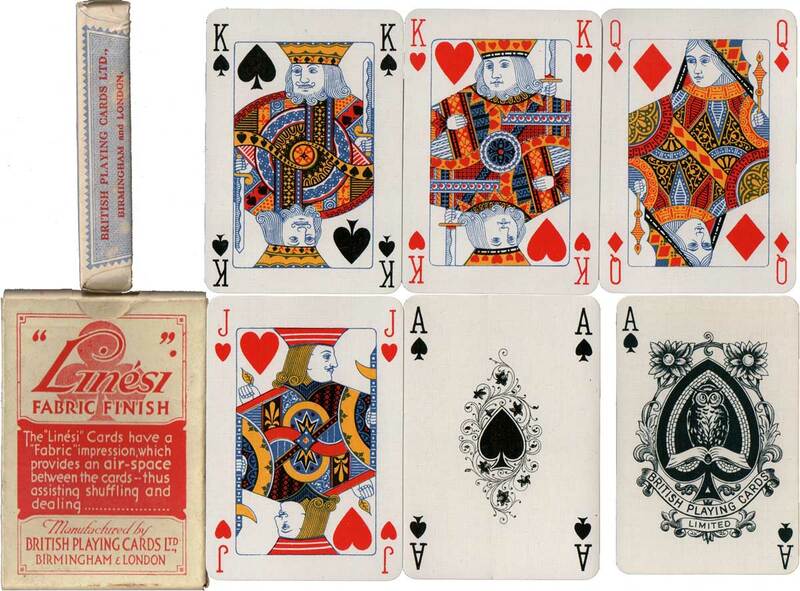 Above: the design top right comes from a pack in a side-folding box, similar to those used by Waddington in their Barribal series; the name on the box is Luxor. The design is more Central American than Ancient Egyptian! 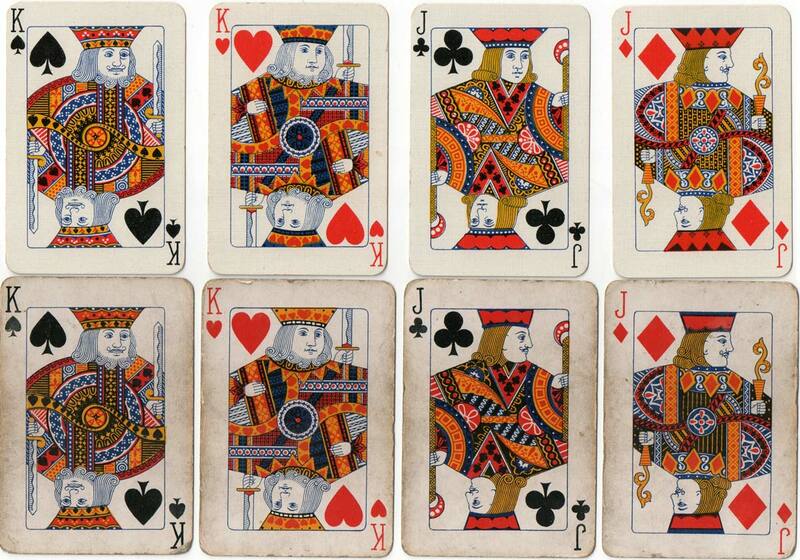 All the cards on the top row are bridge-size, the middle row are all wide and the bottom row shows wide and bridge-size examples. Images and text kindly supplied by Ken Lodge. Above: the box for the wide pack is blank except for the back design sample.